Centrix is a centrifugal fan selection program that enables a fan manufacturer to select, design, cost and quote fans for applications. This program does in a couple of minutes what an experienced fan engineer would take many hours to design and cost! Aerodynamic designs and a nominal range of sizes are entered into the program by H&R Resources. These designs are usually provided by the purchaser. H&R Resources can provide fan aerodynamic design criteria if required. The aerodynamic design is what gives a particular fan its volume, pressure and power characteristics. A single aerodynamic design can meet any volume and pressure that you can think of but the size or speed may not be practical due to mechanical limitations (size outside the range or speed outside the range). Impeller stresses - dependent on speed, temperature, thickness and material selection. Casing thickness - dependent upon fan diameter, pressure and noise breakout. Shaft design - dependent upon impeller weight, belt or coupling load, motor torque, fan arrangement, temperature etc. Bearing selection - dependent on shaft size and loads and rpm. Pedestal design - dependent on fan diameter, power and rpm. Centrix selects a standard size of aerodynamic design and calculates all the above factors (and more). For example a particular fan selection may not be suitable for belt drive because the bearings can't take the load and larger bearings can't be used because of rpm limitations. However the same fan could be direct coupled arrangement 8 with no problems due to the much lower load. Also Arrangement 7 shaft and bearings can often be used when an arrangement 8 shaft can't. 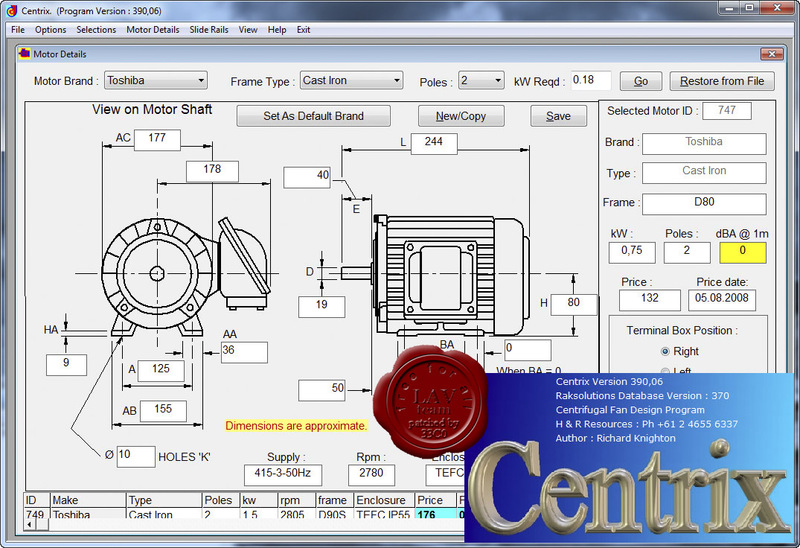 Shaft critical speed is easily calculated by Centrix. If you have ever been unable to balance a fan in service and it vibrates like crazy then you probably have a shaft critical speed problem. Did you know that in overhung fans (arrangements 1, 2, 8, 9) the shorter the distance between the bearings the higher the critical speed is and the larger the impeller overhang from the inboard bearing the lower the critical speed is. The shaft critical speed should always be higher than the fan running speed by a margin of at least 25%. Centrix gives a warning when the critical speed is below 35% margin. Ever had a start up problem? Centrix calculates the starting time and gives warnings alerting you to investigate the use of a larger motor or higher staring torque. Need a speed versus torque curve? Get one from Centrix with dampers open or closed. Centrix enables the user of the software to interact with the program and mechanically design the fan. From this point of view it is invaluable as a design aid and also as a training tool.